I graduated from UC San Francisco Dental School and have been providing quality patient centered restorative dental care since 1982. Over the years, I have completed extensive advanced training in orthodontics, endodontics, dental implants, sleep disordered breathing, oral conscious sedation and comprehensive restorative care. However, there was always a group of patients that had orofacial pain (OFP) that were not completely addressed by traditional medical or dental care. These patients had real pain but could never find someone to see them as a whole person but rather a collection of symptoms. This is why I sought training at UCLA, the premier OFP program in the nation. I am currently the Assistant Director of the UCLA Postgraduate Orofacial Pain and Sleep Medicine program and as such, I am involved in research and instruction working with pain psychologists, neurologists, neurosurgeons, physical therapists and complementary medicine specialists. I am also the co-director of the UCLA TMD/Orofacial Pain Mini-Residency program that is involved in actively training general dentists and specialty residents to help patients with orofacial pain. I grew up in Sacramento and attended American River College before transferring to UC Davis. I attended UC San Francisco School of Dentistry and graduated in 1982 before moving back to Sacramento. My wife, Carmen, and I have been married for over 38 years, have three children and two grandchildren. We have lived in Roseville for over 25 years. Carmen, who has a Masters in Health Education, has taught dental hygiene in a university, college, and private college setting. She currently divides her time working in the office and taking care of our grandkids. I have been active in various schools, community, and professional organizations and have received the Helen Hamilton Award for service to the community as well as the Distinguished Member Award for service to my profession. 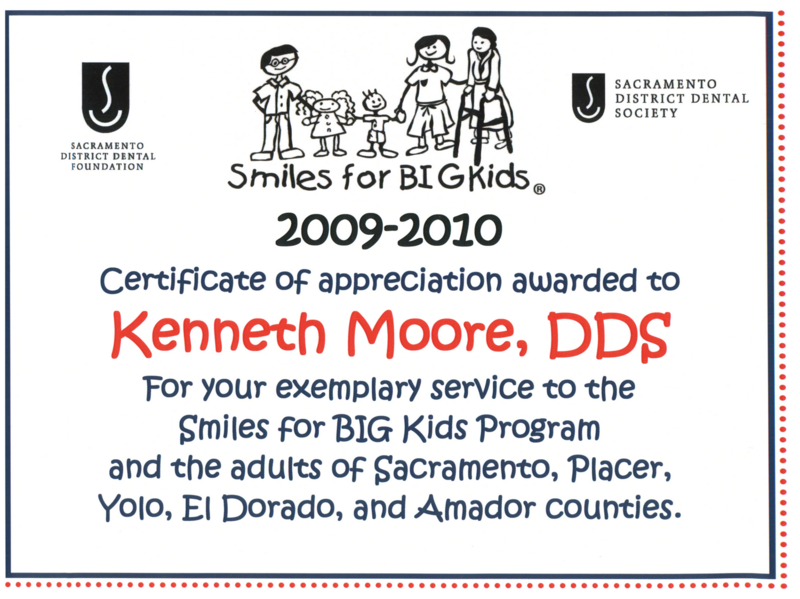 I have also been the president of the Sacramento District Dental Foundation that operates and funds programs designed to help the underserved children and families of our community. I’m currently on the board of directors of the Headache Cooperative of the Pacific, which consists of headache neurologists, physicians, pain psychologists, and orofacial pain specialists. My entire team and I are looking forward to meeting each one of you in the near future. 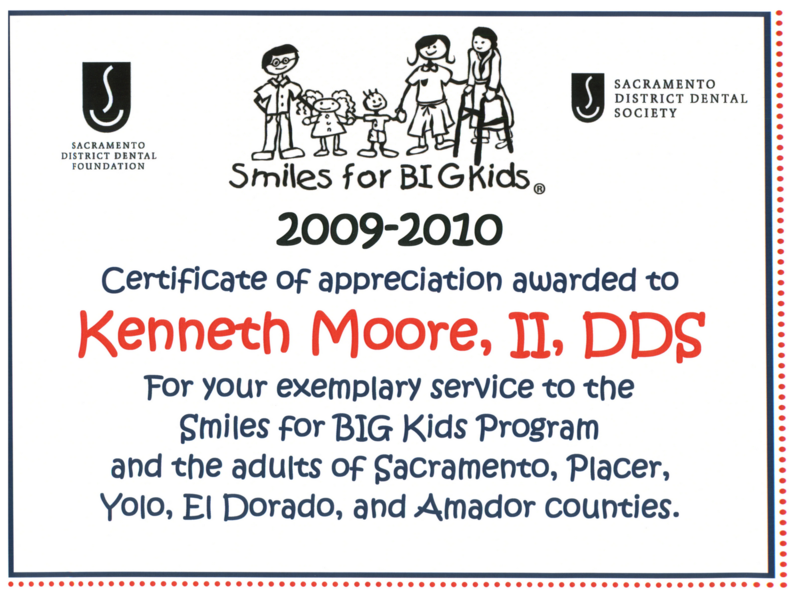 Carmen and I are proud to introduce the newest member to your dental team, our son Kenneth E. Moore II, DDS. 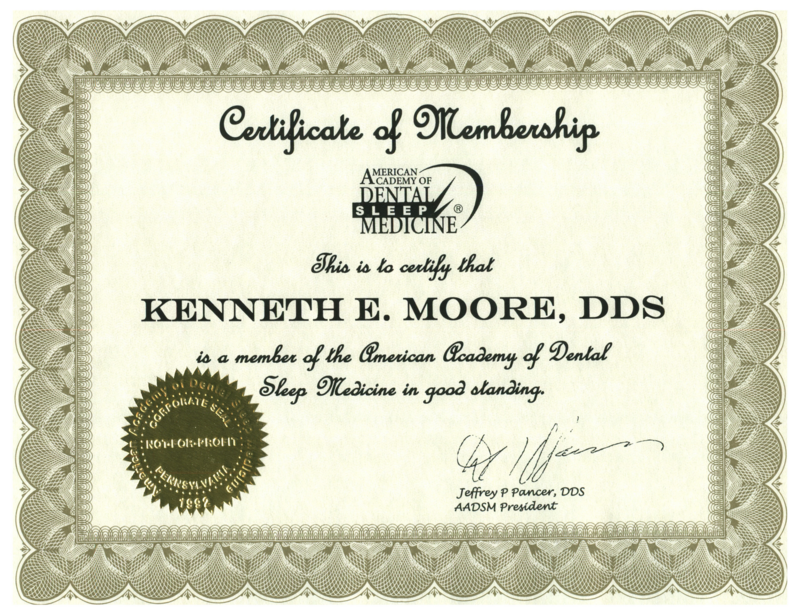 Dr. “Kenney” Moore received his Doctorate in Dental Surgery from the University of Pacific’s Arthur A. Dugoni School of Dentistry in San Francisco, California in 2007. Prior to dental school, he received his Bachelor of Science from the University of California, San Diego in 2004 and also graduated in 2000 from Oakmont High School. Dr. “Kenney” Moore enjoys a variety of outdoor sports, composing and playing music, and video editing/computer design. Our entire dental family is dedicated to excellence and helping you attain optimal health. We are good people working hard to provide you with the very best. Our family looks forward to caring for your family for many years to come, and your continued support and referrals are always greatly appreciated.